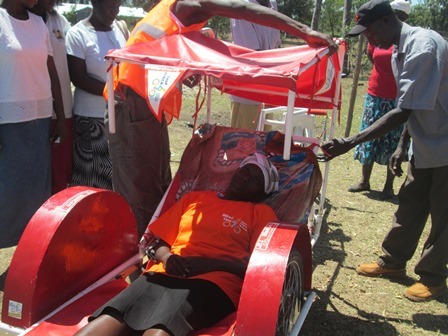 CooP-Africa has equipped various Kenyan communities with bicycle ambulances. The communities are trained in the use of the ambulances. How do you put a sick person safely on the stretcher? And how do you put the stretcher on the bicycle? And how do you ensure the sick person reaches the health facility safely? The training covers all these areas. The bicycle ambulances can transport people who are sick or in labour quickly and safely to a health facility. For more information about this project see the Bike4Care project page. To support this programme the support page. No Comments to "Training on bicycle ambulance"